We’ve been having a lot of fun doing our advent activities…it’s been fantastic overall. Here’s a few highlights from the past week. 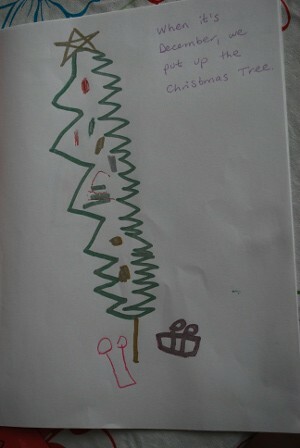 Several days ago we made books about Christmas. It was super fun — I think it was the best activity we have done so far — and we’ll definitely do this one again next year. I asked the kids to think of things we do at Christmas — a lot of their ideas came from things we’d done because of the calendar — and then they drew pictures of their ideas with pretty sparkly markers. 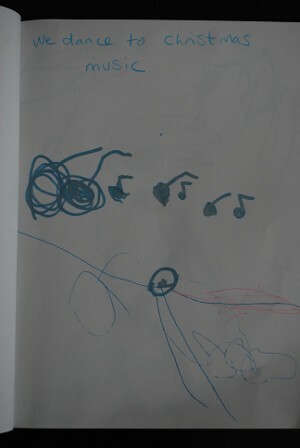 Then we made a cover page and stapled it all together. That last one there is not actually a pregnant Santa, but rather, Santa carrying a bag of toys (very close to his body) with a doll inside. Just in case you were wondering. Aren’t they adorable? I’ll definitely be keeping these forever. I should mention that for many of the Gal’s pictures, I drew her an outline — the outline of a tree, say, or a stocking or a gingerbread house — and then she “decorated” it. 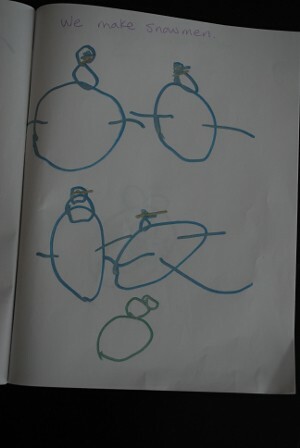 The Captain was able to draw most of his pictures himself. 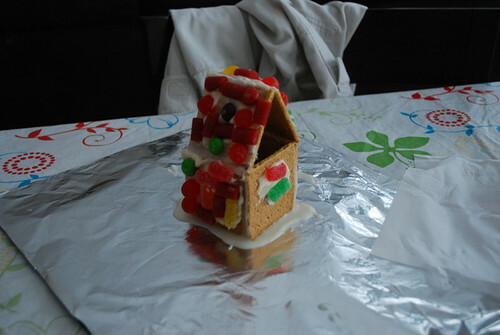 Another thing we did was make gingerbread houses. I used graham crackers for the sides and roof, so we didn’t have to do any actual cooking. The Captain is allergic to eggs so we could not use the traditional royal icing for glue. Instead I made up a mixture of icing sugar and orange juice (1 cup sugar to 4 teaspoons juice) and it worked okay in that it dried hard and solid, but it was very runny at first and our houses kept falling over. Next year I’d give the icing 15 or 20 minutes to harden up a bit before assembly. And also the eating. They didn’t last long. 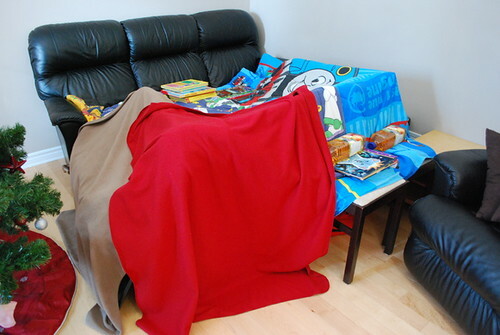 At first the kids were like, okay, nice fort, what the heck do we do with it? But once I gave them flashlights they were totally hooked. We left the fort up for a week and I barely saw them during the day — they were always off reading books or playing games in the fort. With flashlights. 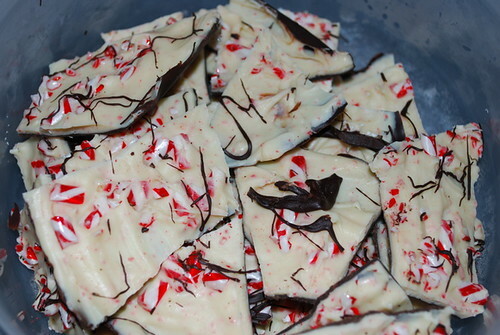 This is called Peppermint Bark. IT IS GOOD. 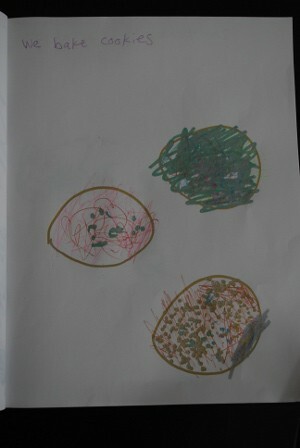 Also, it’s surprisingly easy to make and a very fun activity for kids of all ages. I’ll put the instructions after the jump, since this post is already long enough! Take a standard 12-inch pizza pan and line it with wax paper (I find it helps to tape the wax paper in place). Spread the 1 cup of semi-sweet chips in a microwave safe bowl. Microwave at 50% for one minute. Remove, stir, and drizzle with 1 tablespoon oil. Return to microwave and heat at 60% for one minute. Remove and stir well; this should be enough to melt all the chips but if needed, put it back in at 50% for 30 second intervals until melted. Spread out the melted chocolate on the pizza pan and pop it in the freezer. Older kids can do this whole step themselves; for my little ones, I heated the chips and they just helped spread it on the pan. Let the pan stay in the freezer for 15 minutes. While it’s in there, unwrap the candy canes (you may want to do this in advance, as it does take a few minutes and it’s pretty hard for the kids to do, so they lose patience). Put the candy canes in a ziploc freezer bag (I divide them into two bags so each kid gets his own bag). Now, let the kids wail away on the bags with hammers. Some tips: plastic or toy hammers probably give enough firepower, if you are worried about letting them take a metal hammer to your countertops; we are looking for chunks, not powder, so take the bags away when they start to get too finely ground; the bags probably will split open, so make sure the counter is clean underneath so you can sweep the bits into a bowl when finished (or, just double bag the canes). The hammering is definitely the fun part. Take the hammered candy canes and filter them with a sieve to separate out the powder from the chunks. Now melt the white chocolate chips. Spread them in a microwave safe bowl and heat for 1 minute at 50%. Remove, stir, and drizzle with about 1 1/2 tablespoons of oil. Heat at 60% for one minute; remove and stir well. This might be enough to melt them; if not, return to the microwave for 30 second intervals at 50%, stirring after each interval to see if they are melted. Mix the powdery cane bits with the white chocolate. Remove the pan from the freezer and spread the white chocolate over the dark chocolate. Sprinkle the candy cane chunks evenly over the top and then press well into the white chocolate layer. Return the pan to the freezer for 15 more minutes. If you’re feeling really energetic, you can then take the 2 tablespoons of dark chocolate you have left over, and melt them in the microwave with a little oil as above (1 min at 50%, stir and add oil, 1 more min at 50%). Then, after the 15 minutes are up, remove the pan from the freezer and drizzle/flick the chocolate on top. Return to the freezer for 15 more minutes. Peel the bark from the wax paper and smash it into bits. You can use a hammer (a real hammer is required) when it is very frozen — a few well-placed taps will split it up. Or, let it thaw for around 5 minutes, and you should be able to snap it with your hands. There’s better licking that way. I like to store mine in the freezer so it stays fresh — let pieces thaw for 15-20 min before serving. Wee! I think I found today’s advent activity! Thanks!! 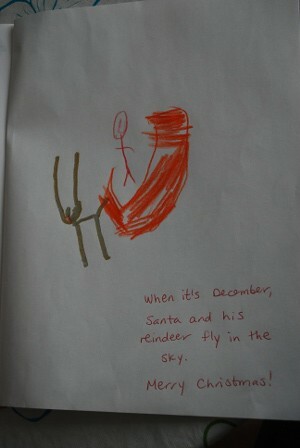 That’s funny that you’re keeping all their drawings. I used to do that and then they started to overwhelm the house and I’d go through them and wonder why I ever kept them. Good idea to write the purpose of the drawing on it and also maybe the date on the back and something about why you’re keeping it. Or 5 years from now you’ll look at the 10,000 drawings and wonder why you have them all. We’ve had fun too but the past few days have been kinda pathetic (too many other activities going on!). Tomorrow is an idea stolen from Andrea, ‘fancy dinner’ and I’m sure the girls will looooove it! 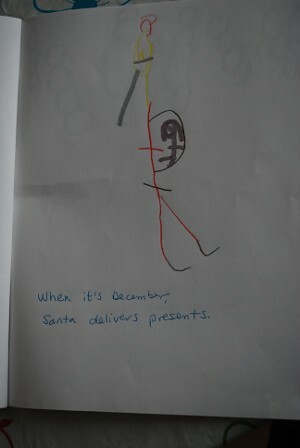 I am going to steal your book idea, what a great way to capture what they think Christmas is all about. I pack away their art work and special Christmas activities with our Christmas decorations and love when the time comes to pull them out and remember! It’s easier to make the graham cracker gingerbread house if you brace the graham crackers alongside empty cartons of milk, like the kids get at school. Pregnant Santa is my favorite. 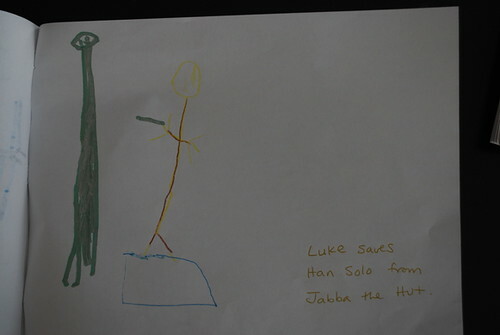 I once saw pictures of a dad who’d had several of his son’s early artwork pieces tattoo’d onto him. They were AWESOME.